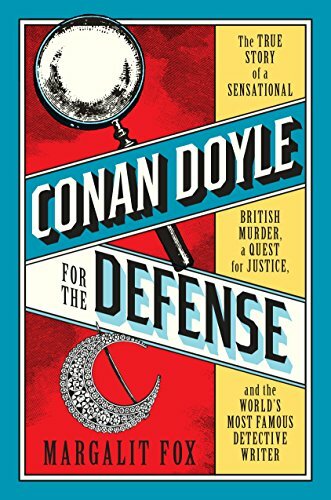 In her latest nonfiction outing, longtime New York Times copy editor and obituary writer Margalit Fox tells the story of Arthur Conan Doyle's early 20th century efforts to exonerate a man accused of beating to death Marion Gilchrist, a wealthy, elderly woman in her Glasgow home. The case caused a sensation in Scotland. In 1909, after being wrongly accused of bludgeoning Gilchrist and stealing her jewelry, Oscar Slater, a Jewish n'eer-do-well, was tried and convicted of the crime and nearly hanged. His sentence was commuted to life in prison, at hard labor, just 48 hours before his scheduled execution. A physician before he was a mystery writer, Conan Doyle would seem to be the perfect candidate to act as his own Sherlock Holmes in trying to clear Slater, and free him from his long prison sentence in a bleak, windy penitentiary on the Scottish coast. A critical theme that runs through this engrossing book is the similarity between medical diagnosis and criminal detection. And yet, Conan Doyle knew the pitfalls of trying to live up to his fictional paragon, apart from elevated, if not insurmountable expectations. When it comes to murder, fact and fiction are quite different. “It is one thing to grapple with a practical problem and quite another thing when you are allowed to solve it under your own conditions,” Conan Doyle cautioned. In 1912, Conan Doyle published The Case of Oscar Slater, an 80-page book—sold for pennies to increase its circulation—which systematically demolished the prosecution’s case. But despite his fame and genius, “his book had little immediate effect,” Fox writes, “and Slater remained where he was.” It would take Conan Doyle more than fifteen years to free him in 1927. One of the first things the celebrated writer learned in his frustrating, real life foray into crime detection was that some things never seem to change. That is as true today as it was more than a century ago. As Fox reminds us, Holmes was drawn on Conan Doyle’s legendary Edinburgh University Medical School professor. Joseph Bell was a master of deductive reasoning and the use of observation, as well as of forensic science, who frequently assisted the police. Bell reached a similar conclusion about the authorities. In a way, Fox believes, the campaign to free Slater was the Scottish version of the effort to free Capt. Alfred Dreyfus in France during the same period (a comparison Slater also embraced). But Dreyfus was a much more dignified and noble victim, and thus easier to defend and to build public support for. If anyone, Slater more closely resembles the hapless, marginalized Mendel Beilis, who was accused of blood libel in Russia in 1911. Beilis, freed after a worldwide campaign, was the model for Bernard Malamud’s novel, The Fixer, which was later made into a movie. Fox gives us a vivid portrait of Slater, largely through his letters from prison, and after. However, Fox also relies a good deal on secondary sources, especially previous books on the case, in her entertaining retelling. For some readers, Fox’s extensive, sometimes laborious discussion of the history and development of Victorian and Edwardian crime detection may feel like term paper-ish padding, interrupting the narrative. Ultimately, freedom and vindication would take a smuggled-out letter from the imprisoned Slater to Conan Doyle in the 1920s; a new book and newspaper expose by a committed journalist, supported by Conan Doyle; and recantations by two eyewitnesses. Almost all of Conan Doyle’s work on the Slater case took place at a Holmesian remove. He sent Slater a single letter while he was in prison, and they met face-to-face only once, after Slater’s release in 1927. Unfortunately, Fox writes, despite the mystery writer’s best efforts, Slater’s story “ends in what Conan Doyle called ‘a painful and sordid aftermath.’” This included bitter recriminations between the two men, and even the threat of a law suit over money used for Slater’s successful appeal. If Oscar Slater did not kill Marion Gilchrist, who did? On this point Fox says she remains “resolutely agnostic,” although like Conan Doyle and other investigators, she strongly suggests several candidates. This is never a satisfying conclusion for true crime aficionados, so in that respect at least, the game is still afoot. Mark I. Pinsky has covered sensational murder cases on both U.S. coasts for nearly half a century, including serial killer Ted Bundy and Green Beret Dr. Jeffrey MacDonald for the New York Times and the Los Angeles Times, among others. His forthcoming book is Drifting into Darkness: Murders, Madness, Suicide and a Death "Under Suspicious Circumstances."